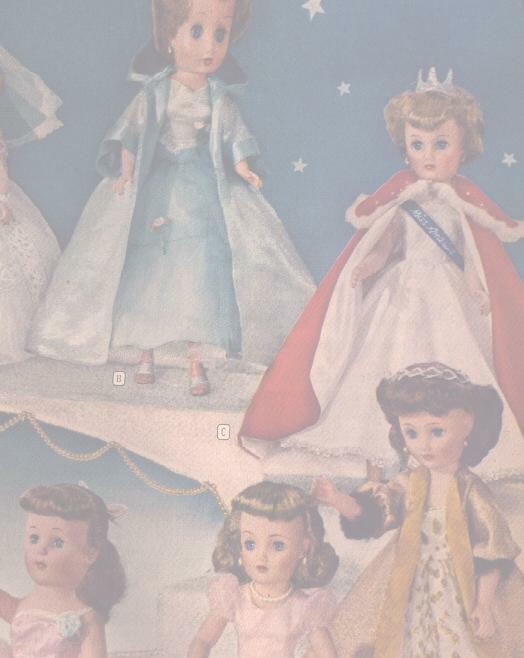 In 1958 many other companies issued 10 1/2 inch fashion dolls to compete with Little Miss Revlon. I have just a few shown here. Uneeda issued Suzette for W.T. Grants store and also under the name Tiny Teen for other markets, along with her boyfriend Bob in 1957. 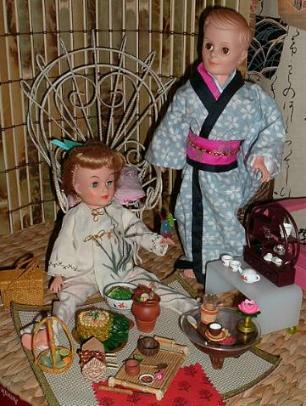 Valentine doll company had a jointed ballerina, Vogue doll company released the Jill doll and her boyfriend Jeff. 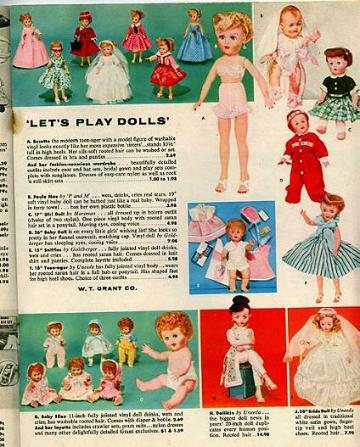 Cosmopolitan Doll Company released Miss Ginger with a line of clothing for her, and many other companies made similar size and style dolls, some unmarked, some marked with a Circle P on the back of their necks. Uneeda's Tiny Teen bride. 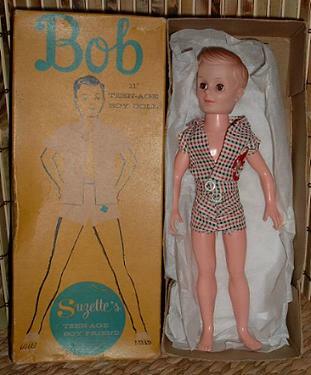 This is the same doll as Uneeda's Suzette, except Tiny Teen had a swivil waist and Suzette did not. 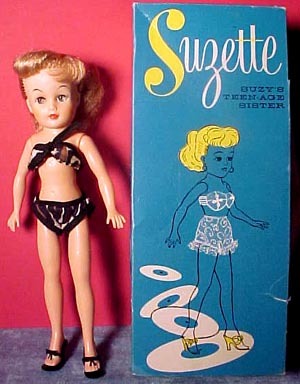 Uneeda's Suzette doll was made for W.T. Grant stores in 1957 and only differed from Tiny Teen in that she had no swivil waist and was a more basic type doll with no earrings and no nail polish. She appeared in Grants 1957 Christmas catalog with a wardrobe of clothing. A page showing Suzette in the 1957 W.T. Grants Christmas flyer. 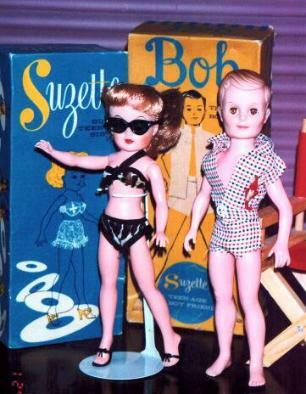 Suzette and her boyfriend Bob with their original boxes in their original swimwear. sunglasses are not original. 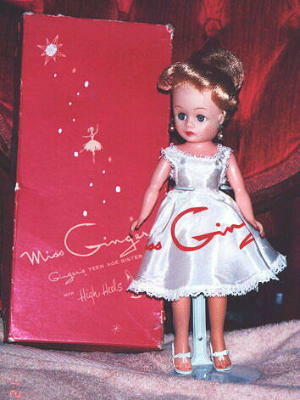 Cosmopolitan Doll Company released Miss Ginger in 1957. She appeared in the Montgomery Ward Christmas catalog in 1957 with a wardrobe of clothing and a giftset. She is marked Ginger on the back of her neck. 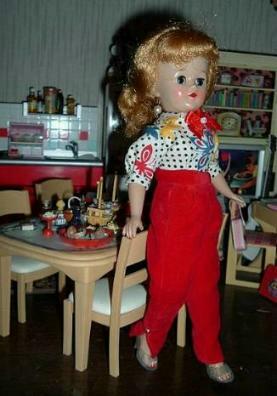 Here she wears a red corderoy jumper outfit that is tagged Cosmopolitan Doll company. All original Ginger outfits should be tagged. Here she wears her original signature slip as she arrives in her box. Vogue Doll Company's Jill doll. Jill is different from most of the other 10 1/2 inch fashion dolls of the 1950's as she is all hard plastic, including her head. The others have hard plastic or vinyl bodies and softer vinyl heads with rooted hair. Jill has a glued on mohair wig and knee joints. Here she wears her original basic black leotard and shoes. I made Jill this vintage style outfit from vintage fabric. 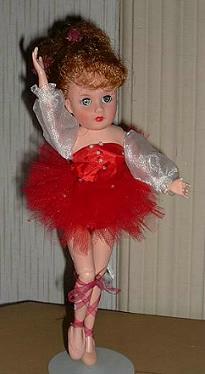 Valentine doll company made ballerinas in the 10 1/2 inch size in 1957 and 1958. I believe this one to be a Little Miss Mannikin. This one wears a replica ballet tutu I made for her and only has jointed knees. The other ballerina is fully jointed at wrists, elbows, ankles, and knees. She is marked 11VW on the back of her neck. To show the Little Miss Mannikin body differences. Here she is next to a Little Miss Revlon. She has a hard plastic body with vinyl head and her feet are smaller and molded into an "on-point" ballerina style. 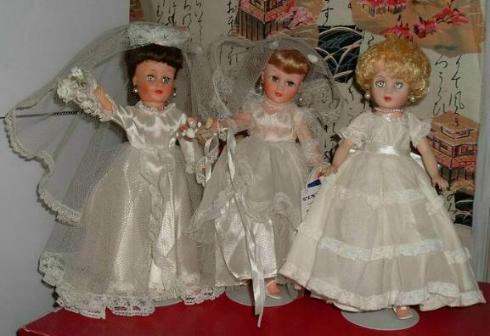 Two Uneeda Tiny Teen dolls in original bridal gowns and on the right a blonde unmarked fashion doll in an untagged vintage gown. A lovely platinum hair doll marked Circle P on the back of her neck. I think she could be a Miss Coty doll as her quality is much better than most Circle P dolls I have. She wears her original underwear. Jewelry is not original to the doll. 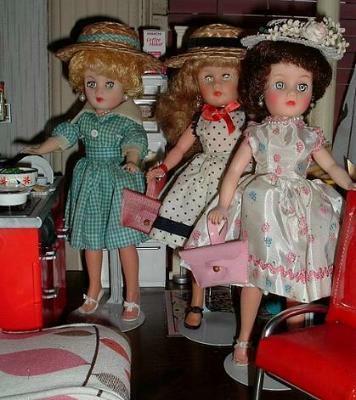 A group of dolls either marked Circle P or unmarked on the back of their necks. The pink dress and the polka dot dress are tagged Cosmpolitan Miss Ginger outfits. The other blue dress is untagged.